What Is the Gülen Movement? Over the last twenty years there has been a movement in schools that has changed the way many children are educated—charter schools. Charter schools are public schools, Kindergarten through 12th grade, that receive public money, but are not subject to the same rules that apply to other public schools. In return, charter schools are accountable to achieve certain goals that are outlined in the school charter. Fethullah Gülen is a Turkish preacher who has started a worldwide network of Muslims to take the principles of Islam and move the religion into the modern world. He was born in 1938 in a village in eastern Turkey. 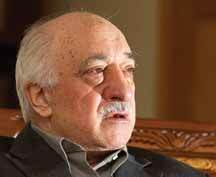 His father was an Imam, and from him, Gülen learned the principles of Islam. It was in Izmir that Gülen applied Nursi’s teaching to create a network of private schools, residences and later universities and turn them into centers of excellence promoting a modern, Islam-based ethical framework.3 From this base in Turkey, Gülen expanded his network into countries that make up the former Soviet Union, the Balkans and finally the West. He started to make inroads into the secular world in earnest after he moved to the United States in 1997. Once in the United States, Gülen applied for permanent re-sidency, which was denied. The Department of Homeland Security characterized Gülen as neither an expert in the field of education nor an educator but rather as “the leader of a large and influential religious and political movement with immense commercial holdings.”4 (His formal education is limited to five years of elementary school. )5 In their written denial, U.S. attorneys for the Department of Homeland Security also stated a suspicion about CIA involvement in funding the Gülen Movement’s global projects. His visa was approved after his appeal, with the help of several CIA agents. 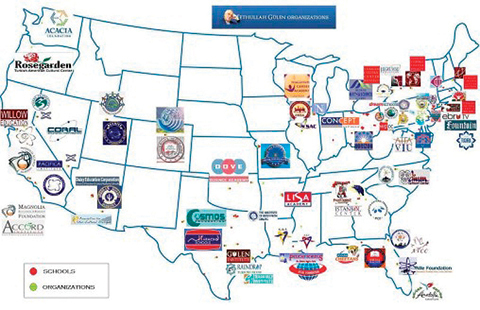 Gülen moved to South-eastern Pennsylvania and established his network of schools in the United States. Broad public awareness about the Gülen charter schools has not yet occurred. One reason this national phenomenon has gone unnoticed for so long is because charter school authorization is fragmented and oversight is local and inadequate. It has taken awhile for anyone to become aware that there is a multi-district, multi-state charter school pattern in operation. Each year that goes by, more and more U.S. tax dollars have become involved with the establishment and support of these Gülen charter schools with very little public discussion about using taxes to fund them. •	Emphasis on math and science; yet little experimental science. •	High scores on standardized tests, even in cases of very challenging demographics. •	Chronic problems with special education compliance. •	High teacher turnover; teachers, administrators disappear and appear mysteriously. •	Turkish cultural activities such as Turkish clubs, elaborately costumed student participation in regional “Turkish Olympiads” and class trips to Anatolian/Turkish festivals. •	School-sponsored trips to Turkey, usually disguised as “International” or “European” trips (scan the photo galleries on the school web sites). Gülen does not approve of the title, “Gülen Movement.” In-stead he refers to it as a “volunteers’ (hizmet) movement.” Hizmet is one of the highest duties in Islam, implying both a religious and national service. Gülen’s community of followers is known as the cemaat. He is referred to as their hocaefendi (master lord). Equally disturbing is the encroachment of the Gülen Movement into American politics. The FGC is known to have sup-ported the election campaigns of various U.S. politicians. These same politicians also sought the blessing of the Gülen Movement by appearing at FGC events. For instance, Hillary Clinton is known to have attended FGC events in the U.S., including a September 2007 Ramadan breakfast organized by the Gülenist Turkish Cultural Center in New York City. One can draw parallels between the United States and the Northern Kingdom written about in the Book of Hosea. Both had advanced technologies and unparalleled prosperity. Also, they both had evidence of moral decay: they rejected God throughout the culture. Hosea then chronicles the Northern Kingdom’s suffering from God’s judgment: he gave the Kingdom over to Assyria, a country now made up of Iraq, Syria, and parts of Iran, Egypt, and Turkey. All of these countries are now predominantly Muslim. Is God giving the United States over to modern-day “Assyrians”? Imagine a cityscape in which the minaret, not the church steeple, dominates. Many fear that the “Ground Zero Mosque” may be the start of just such a skyline. After the morning of September 11, 2001, Americans remain perplexed about the faith of Islam. How could a religion like Islam make young men decide to fly airplanes into buildings? How could such a view of the world produce such zealots? Such world-views are complex and confusing to the Western mind. Schools such as those in the Gülen Movement promote a skewed view of the world and expose young minds to the dangers of Islam. Americans should ask how the Gülen Movement has man-aged to establish such inroads into the American education system. It is a movement that needs to have oversight and must be made to conform to the laws of the United States, just as any other education institution that receives public funding. Danene Vincent, Silver Medallion holder, did the original research for this article. Steve Elwart can be contacted at Steve.Elwart@studycenter.com. February 2011 Personal Update NewsJournal. 1. http://www.edreform.com/Archive/?Annual_Survey_of_Americas_Charter_Schools_2008. Retrieved September 19, 2009. 2. “Objectives of charter schools with Turkish ties questioned”: http://www.usatoday.com/news/education/2010-08-17-turkishfinal17_CV_N.htm. 4. Fethullah Gülen’s Grand Ambition, The Middle East Quarterly, Winter 2009, http://www.meforum.org/2045/fethullah-gulens-grand-ambition#ftn51. 6. Greg Toppo (August 17, 2010), http://www.usatoday.com/news/education/2010-08-17-turkishfinal17_CV_N.htm. 7. The H-1B visa allows U.S. employers to temporarily employ foreign work-ers in specialty occupations. 9. “Objectives of charter schools with Turkish ties questioned”: http://www.usatoday.com/news/education/2010-08-17-turkishfinal17_CV_N.htm. 10. World’s “Most Dangerous Islamist” Alive, Well, and Living in Pennsyl-vania, Paul Williams, Ph.D., April 7, 2010, Family Security Matters.